Seems everybody and their pet sea monkey are DJs these days. But what do they really do exactly, besides stand up there and play other people's music? Club DJs are a different breed. If they're any good, they have personality and style and read the crowd well — in addition to knowing how to creatively mix the latest block-rockin' beats. 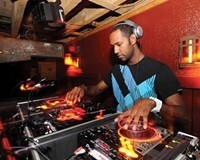 Our voters pick DJ M.A.S.S. Fx (Perri Young), best known for sets on Fridays at deLux, Saturdays at Europa and the occasional night at Epic Theatre. "I was completely surprised," Young says about winning the reader poll. "It's a good feeling to know that I have so much support from the city that I love." Runners-up include DJ Matthew Busch, who keeps the party going at the Lucky Buddha, and Eric Clary, aka Sharon Husbands, who spins at Babe's, performs at Godfrey's and recently served as emcee of the Miss Gay Dream Girl 2012 Pageant.